I recently read a post by Shelisa at Think Magnet which I found at the Love2Learn2Day Math Monday Blog Hop. The post was about a brilliant game Shelisa plays with her kids every time the family sits down to a meal. I was completely impressed with the game because not only did it grow out of a spontaneous observation by one of her kids (my favorite kind of learning) but she was then inspired and able to turn the moment into a wonderfully complex and endlessly interesting activity. I can't really do justice describing the game here; you'll have to go see for yourself and you'll be glad you did! But, the upshot is that the game is all about attributes and learning how to discern differences and similarities. It is also about just how inspiring a playful approach to learning can really be. For the most part, I've been following my own kid's interest and questioning related to math over the last six months, an inquiry which has focused on measurement, maps, number patterns, and geometry discoveries. Reading Shelisa's post I started wondering how I might incorporate it more directly into our own math explorations. So there I was, later that day, mulling all this over at a semi-conscious level in the back of my brain while sitting on the kitchen floor with my daughter. We had just re-discovered a whole box of tangrams, with four or five puzzles all mixed together. "Look Mama!" the kid exclaimed, "I made a parallelogram out of triangles! And I can use two more triangles to make it into a rectangle!" At the time I was playing around with building squares and I decided to start building onto her rectangle. "Oh, look!" I said, "I can make a big square out of two triangles. And I can make a second square out of four smaller squares. If we make a third square and add it on, we'll have made your rectangle even larger! How can we make the third square differently from the first two?" And that's when it hit me. How many ways can you make...? That's the question I had been asking the kid about the number twenty or the number ten. And here I was asking a similar question (How can you make the third square different from the first two?) about combinations of shapes, and colors, and sizes. 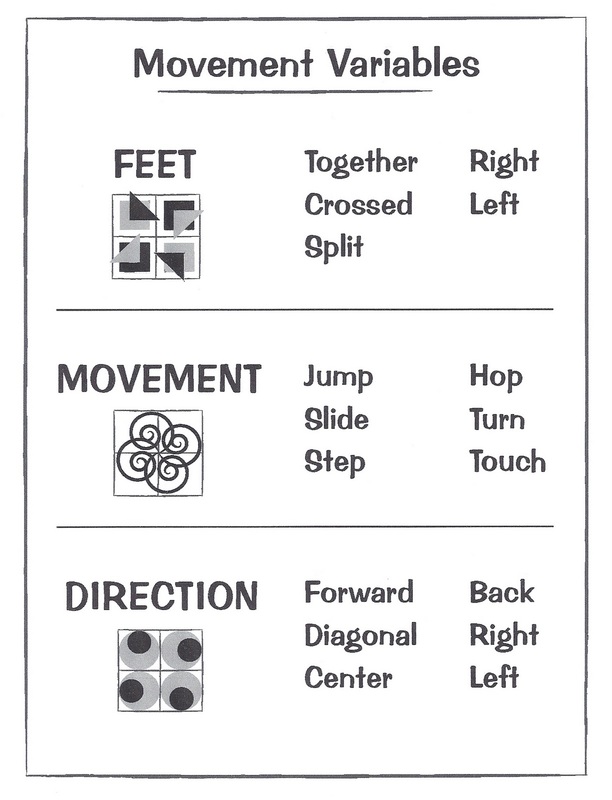 Students use this chart to experiment with what I have always called Movement Variables, except now I realize that, in the math sense, they're a collection of....attributes! For the classic set of attribute blocks it's five shapes, three colors, two thicknesses and two sizes. 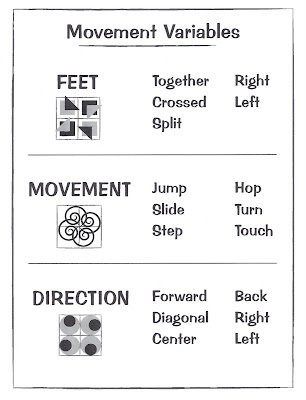 In Math in Your Feet kids choose from five foot positions, six types of movement, and six directions to create each of the four beats in their Pattern A, and then they make choices again when they choreograph Pattern B. There are two other categories to work with as well, including tempo and starting position. The math topics in Math in Your Feet have always been clear to me: concrete, kinesthetic experience with spatial reasoning, combinations, congruence, transformation, reflection, and rotation. These are the things kids and their teachers know are being taught. They've always been the 'selling points' of the program because they are easily recognized and understood as 'math'. But, after years of working out connections between these topics and percussive dance I knew there was more going on than simply learning 'about' math. My hunch was that there was some real mathematical thinking going on, I just needed to figure out where it was occurring and how to explain it. When children are able to identify the elements (attributes) that they have used in their creative dance work they are thinking mathematically. When they use this understanding to analyze and critique others' creative work they are thinking mathematically. Attributes are 'charactaristics of an object or a shape' and I'm confident that this definition is broad enough to include moving pattern units as well. I am struggling at the moment to articulate my thoughts about the differences between identifying attributes in a traditional math education setting vs. choosing attributes in a creative or design process. But, no worries! After more than a year of asking, surfing, conversing, reading and learning, I feel like I have won some kind of prize! And, thanks so much to everyone who is sharing this journey with me. p.s. If you want to learn more about Jump Patterns, here's a link to an article I wrote that details the whole story of what they are, how I developed the tool, and how they are used in the classroom. Malke, thank you so much for pointing to the Plate Game post! And your reflections on patterns and, especially, moving patterns, are very helpful to me personally. I will try to incorporate both into my daily math activities I do with my son.